 An informative if somewhat longwinded paean to the dying traditions that fuel the annual Carnival, as well as a portrait of changing times in the Crescent City. Flake (Tarnished Crown, 1987; Redemptorama, 1984), who lived in New Orleans for a time during the 1970s, returns to chronicle the changes that have recently taken hold of the yearly bacchanal that, since the mid-19th century, has provided a sense of local identity. To tourists, who fuel the increasingly moribund local economy, Carnival begins on Twelfth Night (January 6) and continues until Mardi Gras, the Tuesday before Lent. To New Orleans natives, however, Carnival is a year-round preoccupation. During the year, the city breaks up into distinct racial and ethnic camps, which plan their respective parades and balls and converge only for the duration of Carnival. The changes gripping Carnival are those that are altering the very fabric of the city, namely, shifting demographics--New Orleans now has a sizable black majority--and commercialism, which has seized hold of the celebration and its white nexus, the French Quarter. 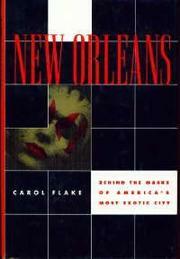 Flake profiles local figures, including Blaine Kern, ``Mr. Mardi Gras,'' who designs many of the floats for the parade and has erected Mardi Gras World, a cheesy exhibition attraction; and Dorothy Mae Taylor, a black councilwoman whose well-intentioned campaign to integrate the ``krewes'' (the secret societies responsible for staging the numerous parades and parties) has met with resistance on many levels and led the krewes to voluntarily decrease their involvement. Lamentably, Flake's discursive prose and scattershot approach to reporting facts and events paints a somewhat bland, albeit accurate, portrait of a city well-known for its spicy cuisine.